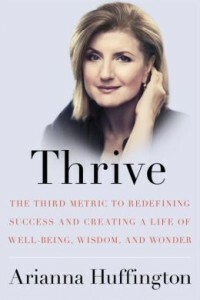 I had already seen Arianna’s TED talk before I read her book. So I had a slight hunch that it might feature quite a bit about sleeping! And it does, amongst a host of other wellbeing type topics. The basic premise of the book is success is more than our careers, it’s our entire lives – our wellbeing. Arianna has some great tips on building a fulfilling life (and not having a heart attack at age 55 or burning out!). Her mum’s wisdom and quotes feature quite a bit and she was obviously a huge influence on her. The big wake up call for Arianna (and the starter for the book) was falling and injuring herself – literally from exhaustion! If we can all read this book and absorb just a few of the tips then perhaps we don’t need to reach the same breaking point that she did. Here’s to working smarter, not harder. And building a successful life – not just a job. 1. What does your good life look like? Grab the book over here.